The budgies can be found in several varieties and colours. 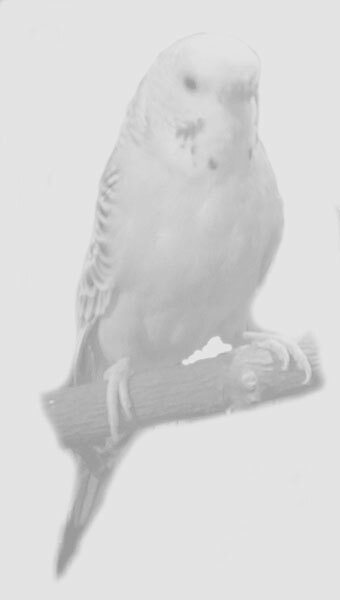 English or "show" budgerigars are about twice as large as their wild-type counterparts. Their overall larger sizes and puffier head feathers give them a boldly exaggerated look. The eyes and beak can be almost totally obscured by these fluffy head feathers. English budgerigars are usually more expensive than wild-type birds even though they have a shorter life span of 7–9 years. 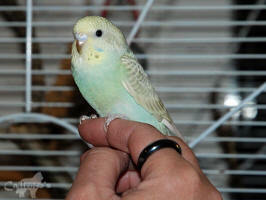 Most captive budgerigars in the pet trade are similar in size and body conformation to wild budgerigars. Wild budgerigars are found throughout the drier parts of Australia, naturally green and yellow with black, scalloped markings on the nape, back, and wings. Breeders have created a rainbow of blues, whites, and yellows, and even forms with small crests. 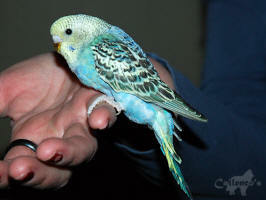 Budgerigars are popular pets around the world due to their small size, low cost, and playful nature. Budgerigars are intelligent and social animals and enjoy the stimulation of toys and interaction with humans, as well as with other budgerigars. A common behavior is chewing material such as wood, especially for females. 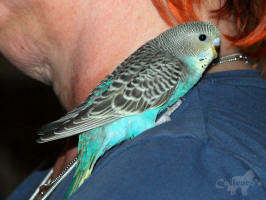 Tame budgerigars can be taught to speak, whistle tunes, and play with humans. Both males and females sing and can learn to mimic sounds and words and do simple tricks. Both singing and mimicry are more pronounced and better perfected in males. Females rarely learn to mimic more than a dozen words. Males can easily acquire vocabularies ranging between a few dozen to a hundred words. Pet males, especially those kept alone, are generally the best speakers. In captivity, budgerigars live an average of eight to ten years, but they can be as old as 15–20 years. Although budgerigars in their natural habitat eat mainly grass seeds, captive budgerigars feed on dry, sprouted, or soaked seeds. A diet of only dry seeds is inadequate for budgerigars. Avian veterinarians recommend pet birds diets be supplemented with foods such as couscous, pasta, rice, fruit, vegetables and pellets but never avocado or chocolate! Budgerigars show signs of affection to their flockmates by preening or feeding one another. Budgerigars feed one another by eating the seeds themselves, and then regurgitating it into their flockmates' mouth. Because of this natural behavior, budgerigars most easily breed in captivity when provided with a nest box. The male will do anything to get the female's attention. He chirpes, tripping up on the stick close to her, letting the pupil enlarges and shrinks rapidly as the eyes 'flash', fluff up the feathers on the head and neck and makes many advances towards the female often touching her with his beak to hers several times in a row, which if he knocked. At first it seems the female completely uninterested. She often turn away from the male, "collapses" and seems almost asleep. But that's only a part of the game and the male continues to try to impress the female he is interested of. Often, the male flies after the female as soon as she moves. The first sign that the female starts to ease up is that the male may sit closer to her on the stick, but she can bite him if he tries to approach too much. Then suddenly she lets the male polish her head feathers and soon after she willingly accept food from the male. He is accepted and the pair is formed! When the two budgies is a pair they begin to nest almost immediately! The male feeds the female more and more, continuing his intense courtship and the females seems to enjoy. One can now see how her ceres darkens (if it wasn't already very dark) and if you observe them long enough you can soon see them mating. A mating is over in seconds and they will mate many times during a nesting. The eggs are 1-2 cm's long and plain white without any coloration. When the female is laying eggs her cere turns a crusty brown colour. A female budgerigar will lay her eggs on alternate days. After the first one, there is usually a two-day gap until the next. She will usually lay between four to eight eggs, which she will incubate (usually starting after laying her 2nd or 3rd) for about 21 days each. Female Budgerigar only leave their nests for very quick defecations and stretches once they've begun incubating and are by then almost exclusively fed by their mate (usually at the nest's entrance). Depending on the clutch size and the beginning of incubation, the age difference between the first and last hatchling can be anywhere from 9 to 16 days. The eggs will take about 18–20 days before they start hatching. The hatchlings are altricial – blind, naked, totally helpless, and their mother feeds them and keeps them warm around the clock day and night. Around 10 days of age, the chicks' eyes will open, and they will start to develop feather down. The appearance of down occurs precisely at the ages (around 9 or 10 days of age) for closed banding of the chicks. They develop feathers around 3 weeks of age and one can often easily note the colour mutation of the individual birds at this point. At this stage of the chicks' development, the male usually has begun to enter the nest to help his female in caring and feeding the chicks. Some budgerigar females, however, totally forbid the male from entering the nest and thus take the full responsibility of rearing the chicks until they fledge. As the chicks develop and grow feathers, they are able to be left on their own for longer and longer periods of time. By the fifth week, the chicks are strong enough that both parents will be comfortable in staying more and more out of the nest. The youngsters will stretch their wings to gain strength before they attempt to fly. 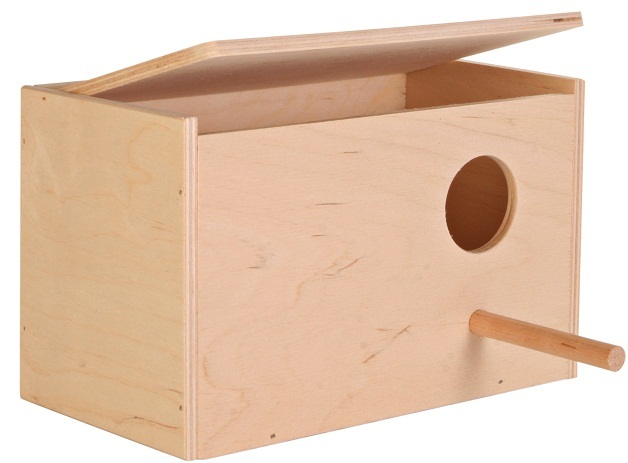 They will also help defend the box from enemies mostly with their loud screeching. Young budgerigars typically fledge (leave the nest) around their fifth week of age and are usually completely weaned a week later. However, the age for fledging as well as weaning can vary slightly depending on whether it is the oldest, the youngest and/or the only surviving chick. Generally speaking, the oldest chick is the first to be weaned. But even though it is logically the last one to be weaned, the youngest chick is often weaned at a younger age than its older sibling(s). This can be a result of mimicking the actions of older siblings. Healthy budgies spend time each day preening themselves so their feathers are ordered and smooth. 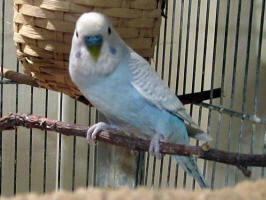 Budgies love whistling and chirping, it can show that your budgie is happy and healthy. Budgies are very social animals and love to communicate, and that doesn’t stop when you bring them into your house! Utfodring: Hirskorvar, undulatblandning, frukt och grönt, pasta. Fjäderdräkt: Undulater bör få bada minst en gång i veckan, det är bra för fjäderdräkten. Vissa fåglar föredrar att duschas med en blomspruta medan andra gärna badar i ett lämpligt fat eller speciellt fågelbadkar. Revirinstinkt: Undulaten är inte aggressiv och trivs lika bra i par som i flock men behöver stort utrymme, t.ex. voljär, om de är flera stycken. Går bra ihop med risfåglar och t.ex. nymfparakiter. Hälsa: Kan lätt drabbas av förvuxen näbb. Ordentligt med grenar att gnaga på är förebyggande. Det är inte ovanligt med tumörer på undulater och de kan även drabbas av s.k. "fransk fällning", som är en virussjukdom. Flygfärdiga: Cirka 5 veckor. Undulatungar bör efter kläckningen hållas tillsammans med minst en matande vuxen fågel i minst 6 veckor. Undulaten delas in i gröna och blå. De gröna färgerna är alltid dominanta över de blå. Den gröna är den naturliga färgen, det vill säga att ursprungligen fanns det bara gröna undulater. Den ursprungliga undulaten har ljusgrön kropp, gult ansikte och svarta teckningar. Efter att människan har "lagt sig i" och släppt ut avlade undulater bland de vilda så finns det numera en uppsjö av färgade undulater även i vilt tillstånd i dag. Till den gröna serien räknas alla varianter av grönt samt även helgula fåglar (lutinos). Till de blå räknas alla varianter av blått, de gulmaskade varianterna samt helvita fåglar, albinos. Den första blå undulaten man vet om föddes 1878 i Belgien. Det är pigmenten som avgör vad en undulat får för färg. Undulaten har inget äkta blått färgpigment, utan färgen skapas genom hur ljuset reflekteras i det så kallade blå lagret hos fjädrarna. Undulater kan ha de flesta färger, enfärgade eller i kombination, brokiga med olika färg på kropp och huvud, med eller utan vågteckning på huvud och vingar. Det finns även undulater med tofs på huvudet, s.k. crest.